‘Right there and then I made up my mind that if ever I got the chance, I would do everything in my power to hurt them, to damage the Nazis and everything they stood for. After a difficult childhood in Australia, Nancy Wake manages to travel first to London and later to Paris, where she talks herself into a job as a foreign correspondent. She is happy in Paris, and meets and marries a man she loves, but as the Nazi Party’s influence grows, she worries about what will happen, and when war breaks out, her fears are realised. Soon, Nancy is part of the resitance movenent, working to undermine the Nazis and to help their victims. 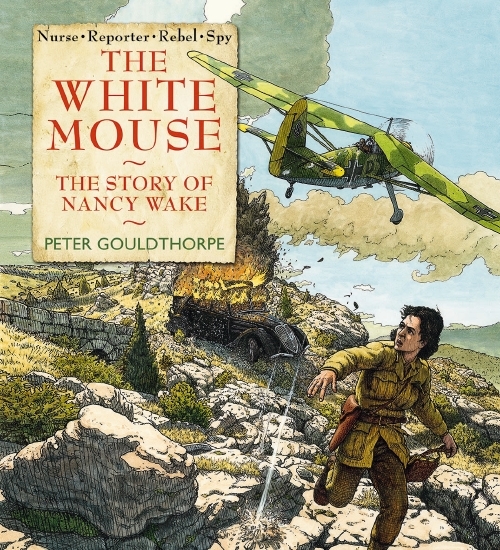 The White Mouse tells the remarkable story of a remarkable Australian woman and her work during World War 2: driving ambulances, helping escaped prisoners, transporting radios and other banned items. As a story which most Australian children are unlikely to know, and one which shows a strong woman working hard to make a difference in a time of hardship, the book is a really important offering. The illustrations – in pen and ink and using techniques such as newspaper headlines and maps in the backgrounds of some pages, and text boxes looking as if they are taken from aging notebooks – have the feel of the time period in which they are set, and are reminiscent of the war story comics and paperback novels which adult readers may remember. A quality book about a fascinating Australian. A bright yellow convertible slithers into the gutter outside my gate. Flashy. European – or Japanese with European pretensions. Too obviously pricey, anyway. For a while, nothing happens, then the driver’s-side door swing open and out steps a rather attractive blonde. Young, pert and lissom, if a bit over-presented. The silky blouse, the stilettos, that skirt so tight she has to wiggle it down over her bum. Swinging a read-leather bag over her shoulder, she gathers a clipboard from the seat, then pauses to peer up at the house with that all-too-familiar expression – evaluating, appraising, judging, doing the mental arithmetic. From the way she quickly looks away, I gather she’s spotted me peeking out from behind the curtains. Frankly, I’m getting heartily sick of these people. I wish they’d just leave me alone. Although I must admit she’s a cut above the paunchy middle-aged blokes they usually dispatch in my direction. Harry Bascombe is an old man, and he’s not doing it gracefully. He lives alone in his family house, rarely venturing out. But an unexpected request has him revisiting his past and remembering details long buried. The story flits back and forth between that final year of primary school and the present. The past is 1956 Melbourne with its social mores, playground politics and the anticipation of the Olympic Games. Harry was a diffident child, bullied and navigating a challenging home life. It is that year that a journalist is interested in. Harry has to revisit a traumatic time and decide just how much of it he wants to share, and with whom. Like waking a sleeping dinosaur, visiting the past can be dangerous and have unexpected consequences, even for those who were there. Harry-of-the-present isn’t a terribly likable character but his revisiting of the past begins to provide some understanding of his behaviours and some empathy. Truth and recollection begin to diverge as Harry revisits his unsettled childhood. Asking for Trouble is told in the first person and Harry is a truly unreliable narrator, prone to rewriting events even as they are happening. The action flits between the present as Harry decides whether or not to be part of a documentary about his past. The past and the present finally meet and the climax takes the reader to a place of uncertainty even in its inevitability. Peter Timms is an experienced writer of non-fiction and this is his first novel. Holly Love’s life fell apart on a Monday. Somehow this made the whole thing seem even more surreal. Being an optimistic sort of person, Holly had always thought of Mondays as new beginnings, days of promise. When Holly Love leaves Sydney bound for her new life in the Blue Mountains, she has no idea just how different her life is about to become. She thinks she’s heading for wedded bliss with her fiancé Andrew. But Andrew has vanished, taking Holly’s heart and all of her savings. All she has is a dodgy car, forty dollars cash and a burning desire of revenge. She is going to track Andrew down and make him pay. But as she tries to figure out what has happened, Holly’s life goes from the helpless to the bizarre. First the investigator she hires turns up dead, then she’s dragged in to a mystery involving a missing person, an Elvis impersonator and a giant snake. And what’s with the black four wheel drive that seems to be following her wherever she goes? Love, Honour and O’Brien is a funny, clever mystery with a blend of the bizarre, the sinister and the just plain funny. Holly is a slightly naïve but determined main character, and the new friends she makes are an entertaining bunch. As an accidental detective, Holly does a pretty good job of figuring out what’s going on, though she relies on a bit of luck and the help of her new friends to get her out of trouble when things get heavy. This is a good fun read, with hints that there may be more stories to come featuring Holly Love. His condition?’ Kate arched an eyebrow. ‘Do you mean the fact that he was an alcoholic? I didn’t realise alcoholism was considered a condition nowadays.’ Kate didn’t mean to sound so harsh, but being a violent drunkard could hardly be pt in the same category as diabetes or heart disease. ‘Y-ye, well … um,’ stammered the solicitor, shuffling through the papers on his desk. After a moment he seemed to collect himself and pointed out the places she had to sign. When he was alive, Kate Thurston’s grandfather was a mean, violent drunkard. But he’s dead now – and he’s bequeathed his property to her. Kate and her children need a new start, so it seems that her grandfather has, at last, done her a favour. But when Kate is confronted by the bad state of the house and the property, and memories from her past emerge, she wonders whether coming back was such a good thing. As she rebuilds the property, Kate must also navigate the dramas of raising a rebellious teenage daughter and a timid son and the difficulties of starting a new relationship. When her ex-husband turns up it seems there might be no escaping the past. North Star is an absorbing novel from new author Karly Lane. Set in rural Australia, the tale blends drama with romance for a pleasing whole. The disgraced deputy headmistress of Sydney’s most exclusive private girls’ school. That was the caption under Josephine Margaret Blanchard’s photograph every time it appeared in the newspaper. Not so long ago Jo Blanchard was the deputy principal of the exclusive Darling Point Ladies’ College. That was before she discovered her husband was having an affair with one of the society matrons who run the school’s fundraising efforts – and decided to out the woman in question at a school function. Now she’s separated, living in a cheap unit, and unemployed. But at 45 Jo has decided on a new path. She’s retrained as a marriage celebrant and is putting her past behind her. If only her ex wasn’t making life difficult by avoiding settlement, her new clients weren’t looking for non-traditional marriages and her best friend Suze hiding a huge secret. Friends Like These is a witty novel from well-known funny lady Wendy Harmer. But while there are some good laughs, this is also a story of triumph – over the past, over adversity of different types, and over threats to happiness. Jo is a strong character who cares about the people around her and sees the best in them. Readers will enjoy seeing her fight her battles , supported by good friends and family. A wonderful blend of humour, romance and life lessons. This book is available in good bookstores, or online from Fishpond. Libby is over men. Every time she’s been serious with one, they’ve cheated and hurt her. Now she’s on a man-fast, and happy to keep it that way. After all, she has plenty of good stuff in her life – a great job that she loves, three wonderful tiddas, and two cats for company at home. She doesn’t need a man. But when she gets the travel bug, Libby finds herself in Paris, surrounded by men and by lovers. Will her resolve falter? Paris Dreaming is the second in Anita Heiss’ ‘Dreaming’ series featuring strong Koori characters each on a quest for personal fulfilment which includes, but is by no means limited to, romance. Set initially in Canberra, then in Paris, the story follows Libby’s adventures as she travels to Paris to represent the National Aboriginal Gallery at an exhibition in the Musee du Quai Branly. In Paris Libby hones her fashion skills, makes new friends and explores exciting career possibilities, whilst also protecting herself from again having her heart broken. Libby is an endearing narrator, sharing her story as a first person narrator. The book is Heiss’s special blend of Koori chit-lick, with strong female Aboriginal characters, and the exploration of serious issues such as racial tolerance and cultural sensitivity alongside romance, fashion and fun. Paris Dreaming is fun and intelligence in equal measure. This book can be purchased from good bookstores, or online from Fishpond. They were floating, tumbling together in a machine not made for tumbling, weightless and free. He considered the physics: gravity recast as acceleration. An odd thought to have, but what thought isn’t odd when death breathes hot and sticky? The world slowed. He could not look at her. Late at night a car runs off the road and Tristan and Grace are left clinging to life as they hang upside down waiting for a rescue that might not come. Tristan has spent his life in pursuit of truth – trying to prove that he, and all people, have free will. Grace’s life has been chiefly devoted to staying alive – she has no time for philosophy. Yet their lives are strangely intertwined and as the night passes and each shares their story, the reader starts to see this connection and ponder how it has led them to this crash. August is a compelling story about life and freedom, set in a post-apocalyptic society. Whist at times the philosophical concepts being explored – based on the theology of Saint Augustine – are difficult to grasp, the story itself and its many layers are so intriguing that it is worthwhile persisting with the difficult bits. From the unusual cover (the text is upside down, a visual device to counter the image of the two characters trapped in the car, which appears upright, but should itself be upside down) to the final twist, this is a story which is deeply intriguing and, ultimately, satisfying. This book can be purchased from good bookstores or online from Fishpond. Jodie smelled bacon and fresh coffee as she ran up the steps to the verandah. She took a second to pull herself together … Bursting through the door and announcing that Matt Weisman, the nice guy who’d rescued them last night, was more than likely a stalker would not be the best method of describing what had just happened … But she had to tell them. Forewarned was forearmed. Jodie Cramer loves the one weekend each year when she and her three best friends escape together for a girls’ weekend. She can forget her busy life as a divorced working mother, and relax with her friends. But this year is different. It’s Jodie’s turn to book the accommodation and, on the road to the country town, their car is run off the road. Jodie finds herself caught up in flashbacks to a horrible night nearly twenty years ago when she and her best friend were abducted. Now Jodie finds signs of trouble wherever she looks, but her friends think she is just paranoid. They don’t know the history of the old barn they are staying in, or its dark secrets. Beyond Fear is a thrilling first novel from debut author Jaye Ford. As the four friends find their weekend plummeting into horror, the characters of Jodie and each of her friends, as well as their new friend Matt Weisman, are developed and explored. Jodie is a feisty yet troubled main character and Matt has his own scars, being on recuperative leave from the police force. Together the pair take centre stage in the battle to outwit two brothers with little to lose. Beyond Fear is the sort of book you don’t want to read late at night, but this is a sign of how well it does its job. A gripping read. When beautiful young women kiss you on the cheek you know you’re over the hill, but I didn’t really feel like that. As Wesley said, I still had the moves. Whether he has the moves or not, Cliff Hardy keeps finding himself in trouble. Since he had his private investigator’s license stripped, his life has taken multiple twists and turns. Most recently, he’s lost all his money to an unscrupulous financial advisor, and now he’s at risk of losing everything. So when he has the chance to find said advisor and perhaps avoid total ruin, he takes it – even though officially he’s not allowed to investigate anything. Cliff Hardy has graced the pages of Australian crime novels for thirty years, and it is wonderful to see him back in Follow the Money. Like a favourite coat, each new tale fits comfortably so that fans know what to expect – but at the same time the character grows and develops a little each time. Follow the Money is no exception. Cliff is in new danger and must face new challenges personally too, meaning that the story avoids becoming too predictable. This book can be purchased in good bookstores, or online from Fishpond. Buying through this link supports Aussiereviews. So that was it. Marcus, the Porsche-driving gazillionaire and I were kaput. And to soften the blow he was offering me a holiday to Greece, all expenses paid. I deliberated over the ethics of the situation for all of five seconds before accepting Marcus’s deal. He knew I was totally cash-strapped. I couldn’t afford a holiday in Sans Souci, let alone Santorini. As one door closes, another opens, right? That’s what Claudia Taylor is hoping anyway. Her affair with her boss is over, which means she should also be looking for a new job. But first she has the chance for two weeks in Greece, where she hopes she can make some decisions about her future. Her two best friends are coming along for the ride – each also hoping the break will help them with their own life decisions. Sophie is struggling with the change from high-flying career girl to stay-at-home mother of one tearaway toddler, and Tara wants to figure out a way to follow her writing dream. Santorini is an idyllic holiday destination, and the break should be therapeutic . Should be. But someone seems to be following Claudia, Sophia’s toddler is causing mayhem and her marriage is on the rocks, and Tara can’t write a word. Claudia’s Big Break is a funny, heart-warming story with soul-searching, mystery and romance all mixed in, for a satisfying combination. A wonderful read.